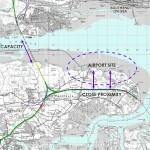 Metrotidal Tunnel and Thames Reach Airport are independent private sector initiatives, the first a solution to providing a new Lower Thames Tunnel, the second a phased new hub airport in the Thames Estuary. While the initiatives are independent they can be fully co-ordinated, with the tunnel providing surface access for a hub airport developed in phases. Metrotidal Tunnel integrates a multi-modal Lower Thames Tunnel with new flood defences for London, tidal power and data storage. The integrated tunnel infrastructure provides economic growth without an associated increase in carbon audit. This green-growth is achieved through improved transport connectivity, with emphasis on rail, integrated with a flood defence system and tidal power plant that generates and stores renewable energy for supply on demand. The tidal plant includes energy-efficient data storage and distribution. These green-growth agglomeration benefits extend beyond the Thames Estuary region across London and the Greater Southeast. Thames Reach Airport is the phased construction of a new, 24-hour, hub airport on the Isle of Grain purpose-designed to be time and energy efficient, providing the shortest times for transfer and transit and the lowest carbon audit per passenger, air-side, land-side and for the surface access. This enables the new airport to command the greatest pool of passenger demand and offer the widest range of destinations of any hub in Europe. The separate tunnel and airport agendas enable policy makers, planners, promoters, investors, stakeholders and regulators to distinguish their separate benefits, impacts and costs. Metrotidal Tunnel provides substantial green-growth agglomeration benefits for the Thames Estuary Region and is viable without an airport while also providing sufficient capacity for the airport surface access. Thames Reach Airport makes use of Metrotidal Tunnel, thereby reducing the start-up costs for the first 24-hour runway and associated hub facilities. The low start-up costs and environmental impacts of the separate tunnel and airport developments enable them to be funded by the private sector. The Thames, the tunnel and the airport create a caduceus of connections between East and West, heralding a new wave of trade, inward investment and green-growth for Britain in the 21st century.